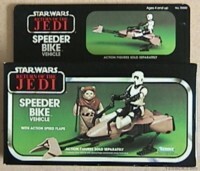 The Speeder Bike was among the first set of toys released (along with the Y-Wing) for Return of the Jedi. 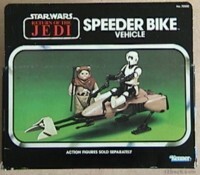 Unlike most boxed toys, the Speeder Bike was actually packaged in a plastic tray instead of the typical cardboard inserts. Speeders are not too hard to find, though some of the smaller pieces are easily lost. Movable landing gear and control flaps.